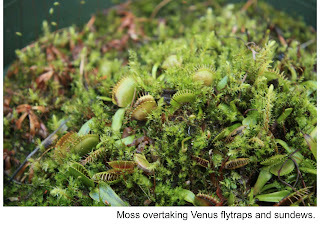 The soggy damp Northwest of California is a great place to grow bog-dwelling carnivorous plants (these are my babies). Even with global warming and our now noticeably drier summers, it generally stays wet enough to keep them happy. Unfortunately, there’s also another wet-loving organism that thrives in this climate. Moss. 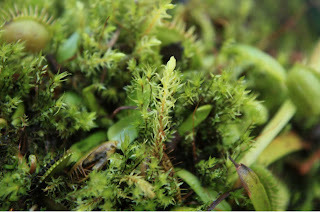 In particular, an invasive, nasty and vigorous moss that spontaneously emerges on the soil of my plants and takes over their pots. I pull it out. It comes back. Only more determined. I really hate this stuff. And it grows not just on my plants, but on everything–our cars, our roof, our walkways… Trust me. It’s not cockroaches that will survive nuclear annihilation. 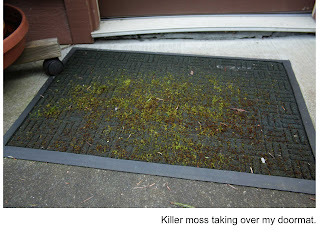 It’s invasive moss. I discovered that there are those with a more entrepreneurial mindset who bottle this stuff and sell it on places like Etsy.